From customers, to technology to day-to-day operations, Larry has seen an industry change, advance and transform again several times over in his 46-year-career. 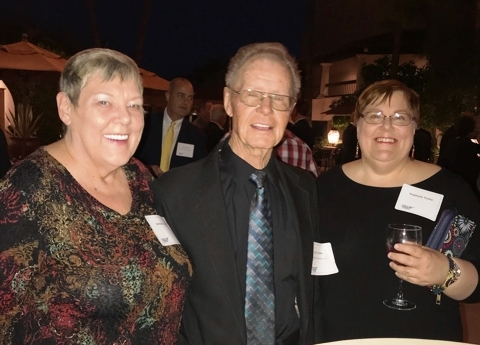 Earlier this month, Larry, who works as a headend technician for TDS, was inducted into the Pioneer Hall of Fame of the Southwest Cable Communications Association (SWCCA). Barbara Mick, manager of Field Cable Marketing, nominated Larry to the Hall of Fame and said it was a privilege to introduce him that evening. Larry began his career as a cable installer in Tucumcari, N.M. in February of 1972. He advanced in his career and moved to Newport Beach, Calif., where he worked as a foreman and chief technician. He moved back to Tucumcari to work as the general manager at Teleprompter Cable TV, which was later acquired by Century Cable TV. For the next 12 years in worked as a plant manager in Farmington, N.M. and as a general manager in Hobbs, N.M. There were several acquisitions that took place between 1997 and he settled in Truth or Consequences, N.M. with Baja Broadband and last, but not least, TDS Telecom. Larry and his wife Darlene (left) and his daughter. When Larry first started, he said, there were no computers, everything was handwritten. We had stacks of handwritten orders. With the advent of computers, “everything has gotten easier” and the equipment is much improved. Larry and his wife Darlene have been married 50 years. They have two children and his daughter joined her parents at the induction ceremony. “My daughter has served as our chauffer because she knows how to drive in the big city,” he joked. “We all had a great time.” The award was presented in Scottsdale, Ariz. The SWCCA serves both Arizona and New Mexico. To date, there are 96 members of the SWCCA Pioneer Hall of Fame. Wow Larry what an impressive career! You have seen and done a lot of hard work for the company!